It takes a special player to make a successful transition across the rugby divide from one code to another. 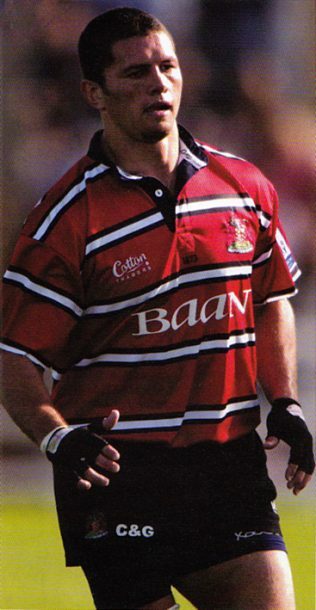 For Henry Rangi Paul this journey began playing league in his native New Zealand, where having excelled for the Te Atatu Roosters and the Auckland representative side he was selected as captain of the Junior Kiwis for their 1993 tour of Great Britain. Paul was immediately catapulted into the senior Kiwi side after an injury crisis on their corresponding tour of the northern hemisphere saw the impressive 19 year old drafted onto the bench to make his debut against France. He would go on to win 23 caps for New Zealand during his rugby league career. His form on that tour caught the attention of a number of top English rugby league clubs, including Wakefield Trinity. Following a season in Yorkshire he made a brief return to New Zealand with Waitakere City Raiders. It wasn’t long before reigning English champions Wigan Warriors came calling, tempting him back to England in 1994. His contribution to a successful Warriors side didn’t go unnoticed, and he was named in the inaugural Super League Dream Team in 1996 in his second season at Central Park. His first foray into rugby union was made possible by impressive displays in the cross-code matches between his employers and Bath, leading to him being loaned to the union outfit in September 1996 before the start of the 1997 Super League season. Paul played nine games for Bath, including their Heineken quarter final defeat to Cardiff. Paul went on to have an illustrious career with Wigan, making 147 appearances for the club and winning a Challenge Cup, a Grand Final, three Premiership Trophies and two Regal Trophies. At the end of his contract in 1998 he made the move across the Pennines to join his younger brother Robbie at Bradford Bulls. During his three seasons at Odsal he added another Challenge Cup – picking up the Lance Todd man of the match trophy – and Grand Final victory to his growing collection of silverware. Having lifted every trophy on offer in the domestic game Paul decided it was a time for a new challenge. He made the switch from league to union by signing a four-year deal worth £1 million with Gloucester in 2001. Part funded by the RFU, the aim of the big money deal was to involve him in the international setup after it transpired he qualified via an English grandfather. The Cherry and Whites fought of stiff competition for his signature from other top league and union clubs, including Canterbury Bulldogs and Auckland Blues. He carried on from where he left off with Wigan and Bradford in his first season in the West Country, by starting in Gloucester’s Zurich Championship play-off final win over Bristol at Twickenham. A result that earnt the club a wildcard European qualification after Leicester finished top as champions. The high-profile nature of Paul’s cross-code switch resulted in England coach Clive Woodward naming him in a 26-man training squad, after playing just once for Gloucester – a dream debut against Caerphilly in which he scored 28 points. A promising start to his time in union resulted in selection for England A against Scotland and Ireland. Full international honours soon followed in the 2002 Six Nations, coming off the bench for Mike Tindall in a defeat to France in Paris. Despite playing no further part in the tournament, he was back in an England shirt in a matter of days helping his adopted country win the 2002 Hong Kong Sevens. His impressive displays in both formats meant he was an integral part of England sevens squad for the 2002 Commonwealth games in Manchester, before being included in a non-age specific England National Academy Programme towards the end of the year. Paul was fast becoming a fans’ favourite at Kingsholm, earning himself a reputation as a skillful and versatile player who could cover a number of positions across the backline. This Gloucester team under the tutelage of head coach Nigel Melville was a fine vintage, and Paul was a key part of its success. During the 2002-2003 season he was a part of the side that won the Powergen Cup, topped the Premiership table for the first time in the club’s history and lost the inaugural play-off final to decide who would be crowned champions of England. Having also helped England sevens retain their Hong Kong crown earlier in the year, he was selected in the England A squad that won the 2003 Churchill Cup in Canada. Paul’s fine form was rewarded with a recall to the senior squad for the 2004 Six Nations, two years after his solitary cap, during which he was used as a substitute in England’s victories over Italy and Scotland. Paul signed a new four year contract with Gloucester in April 2004, which unlike his initial deal did not include RFU funding, before once again being selected in the end of season Churchill Cup squad. Hopes were high that he could establish himself in new head coach Andy Robinson’s long-term plans, when he was selected in the England squad for the autumn internationals. Unfortunately, selection in the starting XV in the 70-0 and 32-16 wins over Canada and South Africa respectively, was followed by a 26th minute substitution in defeat to Australia, signalling the end of his six cap international career. Back at Kingsholm Paul received the recognition he deserved, after being named the season ticket holders player of the year, and nominated for the Zurich Premiership player of the year award. Having helped Gloucester reach the 2005 Zurich Premiership playoff final, a match they lost to Saracens at Twickenham for a place in the Heineken Cup, Paul went on to play one more season in the Cherry and White jersey. After five seasons and 75 Premiership appearances for the club, during one of the most successful periods in its history, he returned to rugby league with Harlequins RL. Not before bringing home a silver medal from the 2006 Commonwealth Games in Melbourne as part of the England sevens team. Paul made the cross-code leap for the third time in his career when he joined Championship side Leeds Carnegie in 2008. Two successful seasons at Headingley enabled Paul to contribute to the club’s promotion to the Premiership and subsequent survival in their first season back in the topflight. A brief spell at Rotherham Titans was cut short when he chose to focus his attention on his coaching commitments with the Russian national side, who he begun working with at the 2010 Churchill Cup, effectively calling time on his playing career. Working under former teammate Kingsley Jones, Paul was part of Russia’s coaching staff at the 2011 World Cup in New Zealand. He has since gone on to establish his own rugby academy in Dubai.